Sean is not a big fan of curry but I am slowly getting him to try and actually like curry dishes. This was a winner at our dinner table, to the extent that I will have to double it next time so we will have leftovers. This is What’s Cookin on Beaty’s Creek. Today it is very snowy on Beaty’s Creek, was I not just talking about spring?? Only in Oklahoma can you wait a day and the weather will be to your liking, no matter what that happens to be. I love the way our weather is here, never a dull moment. Mix ginger, curry, pineapple juice, green onions, and 1 T salt in a bowl. Place thighs on a foil lined baking pan with sides, pull the skin away from thighs and place 1 T of curry mixture under skin, you may want a little more if the thighs are larger. Salt and pepper thighs to your taste and place skin side down and broil for 8minutes, turn over and broil for 8 more minutes or until meat reaches 165’. We eat ours with rice and salad. 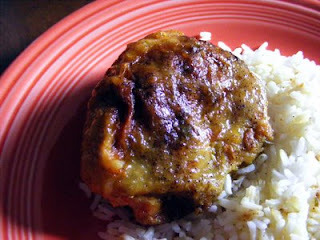 I love simple ways to prepare chicken thighs. and thank you so much for your help with my quiche recipe on taste of home website!